“The Circle” is the newest James Ponsoldt film to hit theaters. Ponsoldt is a celebrated Georgia filmmaker. Not only is he Athens, GA-born, he filmed his 2013 Atlanta Film Festival marquee film, “The Spectacular Now” here in Georgia. And as a person particularly interested and attuned to the writing process of moviemaking, I believe it apt to mention that Ponsoldt was also a 2008 Atlanta Film Festival Screenplay Competition winner. Needless to say, we’re big Ponsoldt fans here in Georgia. He’s someone who celebrates stories, who somehow manages to create a lovely intimacy between characters and viewers, who makes you want to root for the little guy or gal. Which is why I found “The Circle” to be somewhat of a disappointment. This movie was penned by both Ponsoldt and by Dave Eggers, the man who wrote this film’s novel counterpart. “The Circle” tells the tale of Mae Holland (played by the ever-affable, ever-charming, Emma Watson), a young and unimpressive woman, searching for drive and purpose both in her career and her personal life. Mae, with the help of an old friend, is recruited by The Circle, a Facebook-Google-Microsoft-like-mash-up-powerhouse. She quickly rises within the ranks of The Circle and finds herself in a precarious position, and without being even the slightest bit hyperbolic, the fate of western civilization rests in her hands. The film is interesting, really, for only two reasons: 1) the superb casting, and 2) the potential of the story. 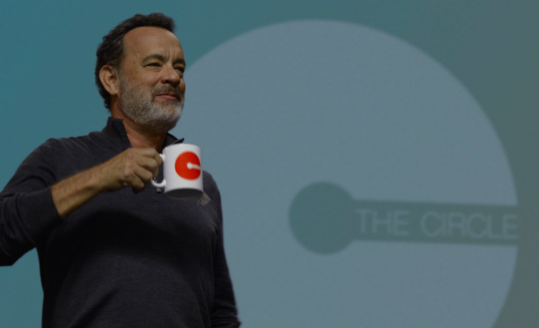 In this film, we have Tom Hanks as the jolly, everyman co-founder and head of “The Circle,” Eamon Bailey (think Steve Jobs). John Boyega plays a tentative and no-longer-drinking-the-Kool-Aid co-founder, Ty Lafitte. At one point, you think he may be Watson’s romantic interest, but that fizzles quicker than it sparks. Patton Oswalt is another co-founder of “The Circle” offering geniality but also secrecy. Bill Paxton plays Watson’s ailing father. The list goes on and on. As far as the potential of the story, at the root of “The Circle,” we have the juxtaposition of technology’s limitlessness capability and the dangerousness of that kind of connectedness. The questions that this story raises are very much worth further thought and contemplation. Who has the right to a ‘moment’? What does it mean to invade privacy? What is private? Are people inherently good or are they only good when they know other people are watching? If we do behave better when people are watching, what’s the point of privacy? Should we protect anonymity? Should censorship exist? I prefer the book to the film, so if you feel this is a story you must explore, check out the novel; it turns and twists in darkened alleys where this film expertly maneuvers all shadows. Even at its emotional crux, the film “The Circle” maintains a sense of no-stakes levity. I never really commit to the severity of the situation, nor to Watson’s dramatic delivery of it. Ponsoldt doesn’t do anything spectacular to bring the text to film.